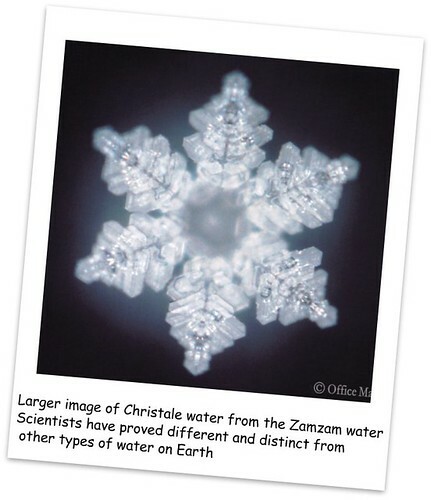 Yes, Zamzam water has a special physique that makes it advantageous water. This fact has been proved by a group of Pakistani researches. The Haj research center also conducted special researches about Zamzam water and it found that it has a wonderful physique that makes it different from other drinkable liquids. Mr. Sami Angaur the manager f the Haj research center told me that when they were digging for more wells of Zamzam they found the more they take from the well the more the amount of water becomes. They also examined the extent of its purity and they found that it is pure and sterile water that has no any germs in it. The prophet Mohammed [PBUH] said, “The water of Zamzam fulfils the purpose for which it has been drunk”. [Refer to Misnad Ahmed]. A man from Yemen was fond of reading Quran from a small Mushaf. As he becomes old he found that he couldn’t read Quran easily from that book because his sight is becoming weak. He heard about the water of Zamzam and its advantage of fulfilling the purpose for which it has been drunk. He came to Haj and he drank from Zamzam. He started reading from that small Mushaf of Quran easily and without any sight problems. He achieved what he wanted because he was confident of that and has deep faith in the saying of the prophet [PBUH], “The water of Zamzam fulfils the purpose for which it has deep drunk” He was also confident and has deep belief in the Quranic sign in which Allah says, “When my servants ask thee concerning me, I am indeed close (to them): I listen to the prayer of every suppliant when he collect on me, let them also with a will listen to my call, and believe in Me. That may walk in the right way”. [2:186] Source: “You ask about the scientific miracles of Quran an Sunna and Shaikh Zindani answers” By Shaikh Abdel Majeed El Zindani. Yusria Abdel-Rahman Haraz from the crimson Alcer in eye after she consumed Zamzam water. She said that she was affected by a crimson alcer in eye. It affect her by a severe headache which cannot be cured by tablets. She was about to become blind in the affected eye. She went to a famous doctor who suggested to give her an injection which will stop the headache but it will also dysfunction the affected eye and consequently she will loose the sight in the affected eye. Mrs. Yusria got frightened but she confident of the mercy of Allah. The almighty and that he would cure her. She thought of performing Omra so that to supplicate to Allah to cure her. She come to Makka and performed Tawaf, there were not many people and the place areas not crowded, therefore, she could be with the Zamzam water for long time. She washed her eyes. When she came back to the hotel she found that her affected eyes was cured and the crimson alcer disappeared. This event proves that it is a confirmation of the Hadeeth which says, “Zamzam water fulfils the purpose for which it has been drunk, if you drink it for getting cured Allah cures you, if you drink it for stomach satisfaction Allah will satisfy you and if you drink it for quenching thirst Allah will quench your thirst.” [Refer to El-Dar Gatni and El-Hukm and Zad] There are many of such events, which proves the truth of what prophet Mohammed [PBUH] said and the holy nature of Zamzam water. Dr. Farooque Antar tells his own story. He says that he has been affected by a stone in his uriter and the doctor could nit remove or destroy it without a surgical operation. But he postponed the operation two times. Meanwhile he performed Omra and supplicated to Allah to cure him without undergoing operation. He drank from Zamzam water and prayed two Rakaat. Then he felt a benching in his uriter and hurried up to the toil and by the grace of Allah he saw the uniracle. The stone came out and he was cured without undergoing a surgical operation. The doctors who were treating Dr. Farooque were surprised for this godly treatment. Source: “Scientific Miracles in Islam & Sunna Nabawiyya” By, Mohammed Kamil Abdel Samad.